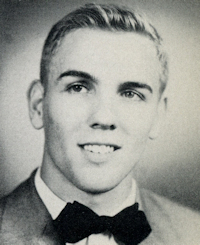 Obituary – Studebaker, Kenneth Edward « Perry High School Alumni Association, Inc.
Wrestling 51-55, Boys’ Quartet 55. ﻿Kenneth Edward Studebaker, 62, Wichita, KS, formerly of Perry, died Monday, August 2, 1999, at Wichita. Graveside services will be held at 9 a.m. Saturday, Aug. 7, 1999, at Grace Hill Cemetery. Arrangements in Wichita were handled by Broadway Mortuary. Studebaker was born April 30, 1937 in Perry, the son of Ralph and Goldie Studebaker. He graduated from Perry High School in 1955 and attended the University of Oklahoma and Oklahoma State University where he majored in zoology and library sciences. Survivors include two brothers, Ralph, Pleasanton, CA, and Don, Denver, CO; one sister, Pat Gray, also of Pleasanton, CA; and a number of nieces and nephews.